Rarely has the easy-going warmth of the Caribbean coast been combined with the architectural sophistication, modern convenience and discernible style, creating an extraordinary opportunity for homeowners. Welcome to The Marbella Club at Candelero Point. Named after the glamorous and exclusive resort in Southern Spain, The Marbella Club offers to its residents the best location, service and amenities. Through a rich and varied use of color, landscaping and architectural detail, the community's five buildings - Cristamar, Andalucía, Alameda, Zaragoza and Málaga - display their own unique sense of charm and personality. This idyllic hideaway is surrounded by ocean waves, the verdant greens of protected parklands and golf courses, all focused on the alluring silhouette of the Isle of Vieques on the horizon. This exclusive oceanfront community, beautifully located facing the Caribbean crystal clear waters of Humacao, Puerto Rico, is being developed by Candelero Point Partners Inc. in three construction phases. Residences on Cristamar and Andalucía buildings have been successfully delivered; Alameda and Zaragoza condominiums, closest residences to the beach, have been recently completed and still have some apartments available. Meanwhile the Malaga residences, the last opportunity to experience The Marbella Club living, are expected to commence construction by the end of 2004. Wait no longer… start enjoying your own private haven today, just contact Margarita Aybar at (787) 852-4992 or via e-mail at sales@themarbellaclub.com. The Marbella Club is the first place where peace and tranquility reconcile with endless available activities. This is partly thanks to its privileged location within the secure 2,750-acre resort community of Palmas del Mar in Humacao Puerto Rico. Palmas del Mar is the largest master planned community in the Caribbean with approximately 2,750 acres of land devoted to a variety of residential, commercial and resort uses. With its combination of primary and secondary homes, lodging facilities and resort amenities, Palmas is the Caribbean's most fully integrated premier destination. Palmas is located on the southeast coast of Puerto Rico approximately 45 miles from San Juan, Puerto Rico's capital and largest city. 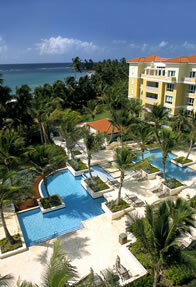 Unique among Puerto Rico residential-resort communities, Palmas has over six miles of Caribbean Sea frontage, including approximately three miles of continuous sand beach. The balance of the water frontage consists of secluded beaches and rocky promontories, offering unparalleled views and settings. In addition, the inland portion of Palmas provides a variety of topographical contours providing for an extensive variety of land use patterns ranging from custom hillside residences to clustered housing developments fronting golf courses or other recreational amenities. Pass through the community’s garden gate and enter a world of vibrant activity. Within The Marbella Club, you may forget all your cares at Marbella’s cascading pool, relax with the soft breezes at our interior courtyards. Begin your fitness routine at the professionally equipped gym, amuse your inner child at the three-headed Dragon Pool, or dive into the waters of the most secluded beach in Palmas. Furthermore, upon completion of the Málaga condominiums, you will be able to enjoy the captivating ambiance of La Cava – Marbella’s exclusive private club. This facility will offer individual, temperature-controlled wood vaults, to preserve your favorite vintage, as well as a lounge area featuring an elegant bar and a cozy fireplace. Steps away, inside Palmas’ resort community, you may also enjoy a light snack at the Beach Club or play a round of golf at any of the two championship golf courses designed by Rees Jones and Gary Player. Palmas also offers 8 miles of jogging trails, a 200-slip marina, 22 tennis courts, facilities for horseback riding, exceptional restaurants, and a first-class school for your children. Nestled in a most exclusive ambiance, our Beach Club is the new "in" place to relax and have fun. Members will now be able to enjoy being part of this special facility, the first one of its type in Puerto Rico. Some select communities include a Beach Club membership with the home. The Beach Club features a reception area, a private sitting beach area, the "Pelican's Watch Poolside Bar", chaise lounges, an ample sun deck, a beach volleyball court and parking facilities for cars and golf carts. In a tropical style pavillion with imposing views of the Caribbean Sea, members will have the choice of dining on the veranda or by the pool. All this in addition to the 8,000 sq. Ft. Swimming pool with water slide, three 25-yard lap-pool lanes, a toddler pool and jacuzzi. Also available for our members are day use lockers and shower facilities. Enjoy the beauty of Palmas as you ride around golf courses and the beach. You can witness today our unique views, the beautiful surrounding areas and the sea. Trail rides at 1:00p and 4:00pm. Other rides can be arranged upon request. The most complete Equestrian Center in the Caribbean. Natural horsemanship - also known as "horse whispering". A new facility designed for international competition. The best training facility in the Caribbean. Paso Fino horses, ponies, trail ride horses rental.